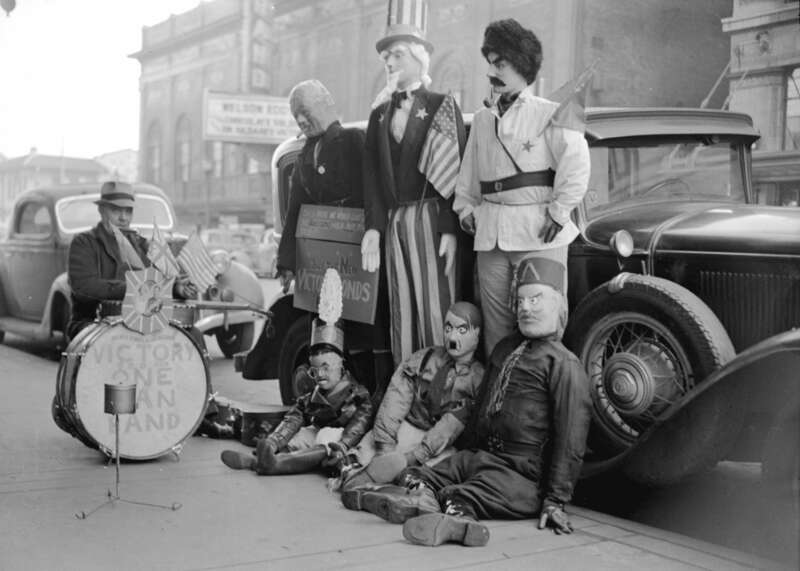 The first time I saw this intriguingly odd photo on the City of Vancouver Archives website, I was inspired to know more about the photo and Alvin Lesk and his Victory One Man Band. The photo depicts Lesk and life sized effigies representing the leaders of the Axis and the Allies. The photograph, dated February 1942, is from a series of photographs taken for the Vancouver News-Herald newspaper by photographer Jack Lindsay. I made a trip to the Vancouver Public Library’s Central Branch to search the historic newspaper microfilm reels to see if I could find the photograph in a February 1942 edition of the Vancouver News-Herald. It wasn’t long before I found the image (or a version thereof) in the Thursday, February 19th edition of the Vancouver News-Herald. 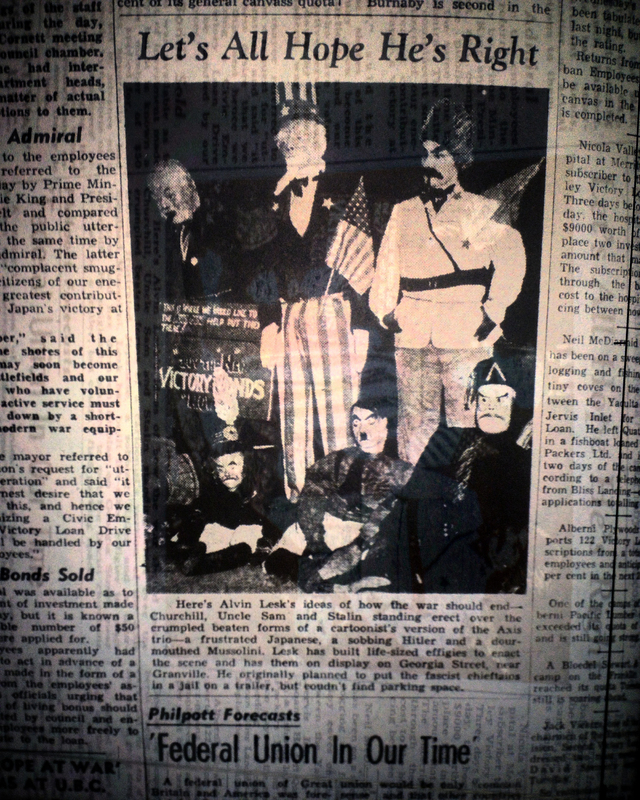 Unfortunately, the image that appears in the paper has cropped out Alvin Lesk and only focuses on his effigies. Photo in the Thursday, February 19th 1942 edition of the Vancouver News-Herald. Here’s Alvin Lesk’s ideas of how the war should end — Churchill, Uncle Sam and Stalin standing erect over the crumpled beaten forms of a cartoonist’s version of the Axis trio — a frustrated Japanese, a sobbing Hitler and a dour mouthed Mussolini. Lesk has built life-sized effigies to enact the scene and has them on display on Georgia Street, near Granville. He originally planned to put the fascist chieftains in a jail on a trailer, but couldn’t find parking space. This is where We would like the Axis Gang, Help put them there! Buy the new Victory Bonds! The Canadian Encyclopedia entry on Victory Loans states that “Victory Loans were Canadian government appeals for money to finance the war effort in WWI and WWII” through the purchase of Victory Bonds. 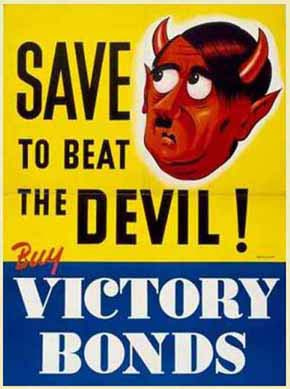 Victory Bond sales were slow in Canada at the beginning of WWII, so after “the slow-moving second war loan of 1940, the Victory Loan returned with the panoply of colourful posters, patriotic pleas and vast sales apparatus which had become familiar in WWI”. Alvin Lesk and his One Man Victory Band were just one example of a local patriotic plea for citizens to buy the “new” Victory Bonds. Though I had some success finding the photo in the newspaper, I wasn’t very successful finding out anything about Alvin Lesk himself. The city directories of the time only listed a Vera Lesk, who was a musician. I suppose it is possible that they were related, but it would be hard to say definitively. I also checked the Vital Statistics for BC and could only find evidence of members of a Lesk family that lived primarily in New Westminster. Vera Lesk appears to be related to those Lesks. I found no evidence of Alvin Lesk in the BC Vital Statistics. So for now, it seems that Alvin Lesk himself remains a bit of mystery. He must have felt very strongly about supporting an Allied victory to put so much energy in creating his effigies and promoting the sale of Victory Bonds. I wonder how many Vancouverites were motivated to buy Victory Bonds by Alvin Lesk’s Victory One Man Band and creative street display? Fun Fact: Author Pierre Berton was the News-Herald’s first city editor.